Developing new systems and syllabuses is important for martial arts. It encourages progress, stimulates debate and can offer truly flexible training suited to individual needs. 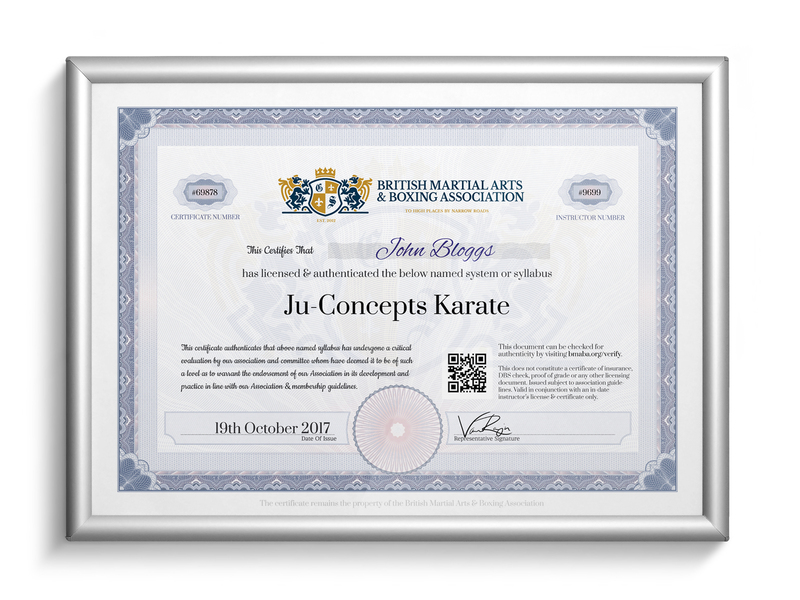 The British Martial Arts & Boxing Association (BMABA) has worked hard over the years to lead the way in which new syllabuses are certified, authenticated and licensed. Alongside certifying syllabuses so they’re checked, vetted and licensed as a credible entity, we’re able to help protect the integrity of your syllabus moving forwards and unlock the door to services such as insurance for specific new teaching systems. Our syllabus recognition service isn’t designed to help people make more money or side-step working for a full dan grade in a separate style. It’s designed to help honest instructors who have unique teaching techniques or original freestyle material get the recognition they deserve. Can I Have My Martial Arts Syllabus Certified? If you’ve worked hard to develop a safe, professional and honest teaching syllabus that you don’t feel fits into other mainstream definitions we’re happy to look at certifying your syllabus for you. BMABA syllabus recognition ensures your style, cross-over or specific teaching syllabus is quality checked by our committee of expert martial artists. We help future proof your submission and offer quality certification to help it progress, along with professional instructor and student insurance to specifically cover what you’re teaching as well. You can certify a syllabus with the BMABA from just £29.99 as a one-off fee. The first you need to do is clearly define all aspects of your syllabus and ensure it’s ready to be put into writing. We can help you along from start to finish with this. You’ll need to be able to demonstrate each level or grade of participation and what’s expected in order to progress. You will need to show that you’ve considered future style development, how you as the licensee will progress and that you’ve considered the history and lineage of any integrated styles too. When you feel you’re ready to progress and submit your syllabus our online member’s area has a specific, safe and secure section for the application. The first part of the review process is for your syllabus to be assessed by our in-house assessment panel who will critically review your teaching methods, syllabus and content. They’re looking for anything that would fail to classify your syllabus as independent (i.e: Using techniques mainly from another syllabus or recognised style) and to ensure the submission is detailed enough to allow a full scope of consideration. After our in-house assessment your syllabus will be anonymously handed over to our Committee and any style specific examiners who will provide a second critical evaluation of your work. They will need to vote either for or against your syllabus approval. The majority vote will be used. After your syllabus has been reviewed by our in-house team and our committee your syllabus will be ready for a result. Everything is done on a democratic voting system, so if our in-house team approves it and so does the committee your syllabus will pass. Likewise, if it’s failed by both parties it will fail the process overall. In the event that it’s passed by one party and not the other your application will become ‘hung’. If this happens both parties will be invited to re-access the work and try and reach a conclusion. If your syllabus is approved you’ll have it officially recognised by a leading UK association and you will have it recognised as a set teaching system for yourself and your club. You will also receive certification & licensing for the approved syllabus and you’ll be entitled to any additional professional services to aid your syllabuses future progression. You’ll need to be a member of our association to enjoy our syllabus recognition service. Can Anyone License A Style? Provided you’ve joined our association as an instructor, and pass our vetting process, you can submit an application for review. There is no politics or requirements to have shaken hands with the director, or registered a certain amount of students, or any other nonsense like that! Can It Be A Combination Of Different Styles? Yes, your syllabus can comprise of elements from different disciplines and styles. Are Any Styles Or Disciplines Not Permitted? We represent more than 250 disciplines and styles. Provided your syllabus comprises of martial arts from within this selection, we’re able to recognise the contributions each discipline plays. Can I Award Myself A Founding Grade? This is a difficult subject. You can award yourself a starting grade, subject the association’s senior committee being in agreement over the suitability of this. In theory we will not issue a founding grade any more senior that your current highest grade from another discipline. So, for example, if you’re a 3rd Dan in Shotokan and we will not generally offer you any starting point higher than that 3rd dan. This can be discussed on a case by case basis ahead of a syllabus submission. Why Might Syllabus Licensing Be Useful? You might teach more than one discipline, and find yourself wanting to offer your students more than just a single set of techniques and traditions to follow. Likewise, you might find your singular discipline taught has evolved over the years, with you trimming off techniques you don’t feel work so well, and adding your own special touch to the other parts remaining. Syllabus licensing is the perfect way of ensuring the set techniques and syllabus you teach to your students is recognised as credible and professional. As an association we can also arrange specialist instructor and student insurance tailored to your unique teaching syllabus for peace of mind. Can You Offer Me Insurance For My Syllabus? Yes, we can. We’ve been offered exceptional latitude by our group cover insurer to define the disciplines we’re able to represent. If we feel your syllabus is of a good enough standard, and professional enough, we can insure you for instructor and student cover. How Can I Progress As A Founder In The Future? We recommend you follow the same syllabus, criteria and requirements as your students. We can help assess you against this going forward, to offer you a ‘third-party’ impartial adjudication to ensure you’re not self promoting without merit.